West flowing Narmada, morning prayers, birds diving to catch their prey, a majestic fort behind the ghats and the clacks of wooden looms beautifully describe the ancient town of Maheshwar in a single sentence. Making its mark in history, Rani Ahilyabai of Maheshwar introduced the art of weaving a unique type of fabric which came to be known as Maheshwari fabric by inviting weavers from Surat. The weavers came as guest artists and later settled at Ahilya fort, Maheswar on ghats of Narmada around 180 years ago. Maheswari weaving is a traditional form of weaving developed by the said weavers from Surat. 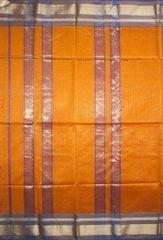 Sarees woven from these fabric have an intrinsic elegance, lightness and charm in them. 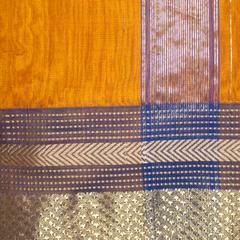 Maheshwari handloom weaving mostly consists of geometrical motifs like checks, stripes and local architectural design on fabrics made of silk-cotton blend and pure cotton. Maheshwari sarees have withstood the effects of time and have retained its elegance and charm among women of all sects and ages of the socitey. This saree is a fine piece of craftsmanship. Handloomed on the ghats of Narmada in Maheshwar, these sarees give you an authentic ethnic look. This exquisitely crafted saree will make you stand apart and will echo your style quotient. 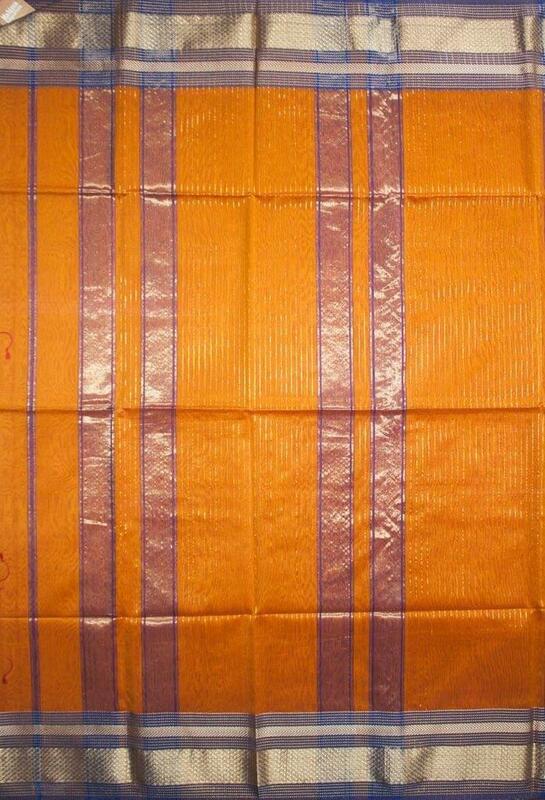 Saree is handmade by Shri Neeraj Chouhan, a renowned artist who has attained mastery in weaving Maheshwari Sarees. Shri Neeraj Chouhan has applied for the India Handloom Brand from the Government of India. India Handloom Brand is accorded only to those artisans who meet certain stringent quality of raw materials, procedures and safety standards. 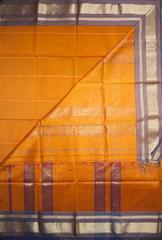 The artisan has to maintain the quality standards to use the India Handloom Brand. By having this brand recognition, customers can be assured of the authenticity and quality of the product that they buy. This is a handwoven product and there might be slight irregularities. These are inherent to handwoven products and they add to their charm!